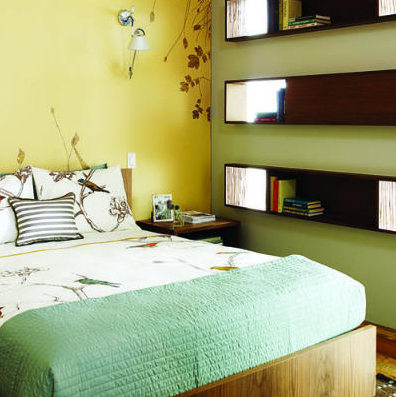 Small spaces mean going vertical so use your walls to incorporate design and decor and keep the footprint free and clear. Loving these shadow box bookshelves that are super easy to make and use. Get a few flat boards and fashion sides to them. Home Depot carries wood and can even help you cut and make these shadow box shelves. I would consider custom cutting a mirror for the back of each bookcase and then hang on the wall. I bet you could do 3 shelves for under $100. A SMALL SPACE D.I.Y. that serves a small space in form and function. I love this project! it's perfect for a spall apace, and really could be a useful way to store things without looking too cluttered!